Sunset Desert Safari offers for all kind of desert safari Deals, dhow cruises, UAE city tours and much more adventure tours in Dubai. Sunset Desert Safari offers the Affordable desert safari deals in Dubai. Here we are giving you the best quality services & Fantastic Arabian Belly Dance, Fire Show & much More. Book The Desert Safari with Quad Biking & Get the most adventurous version of Bike Ridding on the Desert of Arabia. Book the VIP Desert Safari Dubai & Get the adventurous version of VIP Desert Safari on the RED Desert of Arabia. Package for those people who can't be available for the evening Safari tour. So they can choose the Morning Desert Safari Dubai. 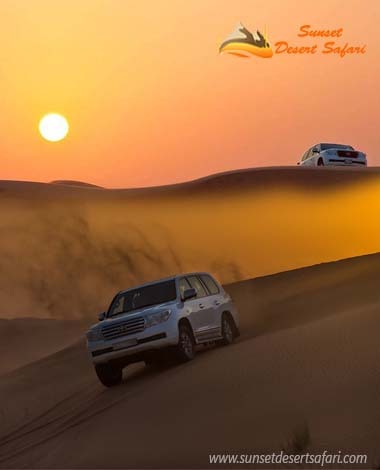 Are you in Dubai and you don't have time to reach for Evening Safari then you can Book the Morning Desert Safari Dubai it includes the Dune Drive on RED Sand of Arabia. 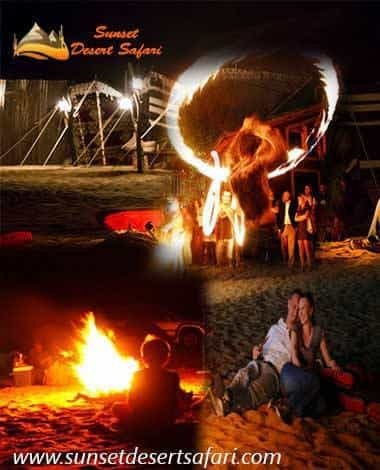 Night Desert Safari in Dubai is the most popular tour in Dubai. Every weekend a lot of people staying in the Desert Safari Camp and enjoying the Arabian Night Life on the Desert of Arabia. Dhow Cruise Creek: Here we are providing you the best Dhow Cruise Dinner on Tradition Arabic Wooden Boat. We were also given you the private Dhow Cruise Dubai for Birthday parties, Married anniversary & much more. Hatta Mountain Safari Tour Includes the Swimming in Hatta Hill Park. City Tour Abu Dhabi includes Home & Drop Sharing Basis; Advance Package Include the Ferrari World Rides. Dubai City is one of the most popular City in the United Arab Emirates, thousands of people come every day for Dubai City Tour. No trip or journey to Dubai is complete with the sunset desert safari. So, engage in this excellent experience as you take part in different kinds of thrilling activities. Having a desert safari make you explore the vastness of the Dubai desert. At Sunset Desert Safari Dubai, you can avail versatile and flexible Desert Safari Deals, which exactly match expectations of all travelers and visitors. So far, plenty of tourists have enjoyed our service. Therefore, are you a travel enthusiast? First of all, Would you like to explore each & every corner in Dubai? Well, you can explore our desert safari tours, which can meet your travel goals highly. Our professional team is always there to assist you. According to your requirement, So we will arrange a one-day trip or week trip to Dubai. Thus, feel free to contact us and share your demands to serve you the best. 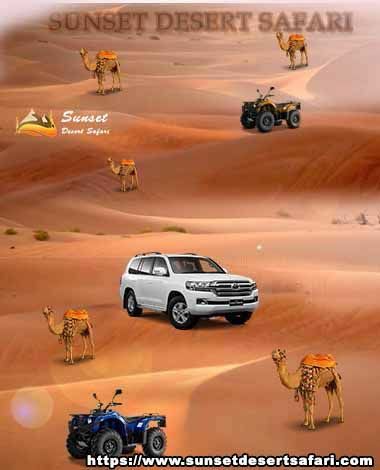 Discover and book the desert safari offers on our site that matches your budget and needs. By picking the comfortable and sophisticated desert safari Dubai, you can explore the beauty and customs of the Dubai desert. To fulfill your dream, we offer customized desert tours based on the user’s demands and needs. By understanding the requirements and expectations of the travelers, we have designed the specialized tour packages at the best price. Our skilled and customized tour packages allow tourists to enjoy the exact blend of the traditional and modern Dubai desert adventurers. All our tour packages come along with some unique and custom features such as sand boarding, camel ride, dune bashing, ski, and other thrilling activities. Here are some of our best Dubai desert safaris. This tour package is one of the most preferred outdoor activities in and around Dubai. Through this tour, we provide an opportunity for the travelers to enjoy and cherish the cold climate. With our tour custom feature, you can spend an excellent time with your family and friends. Evening desert safari at Sunset desert safari is one of the most popular tour packages as it brings travelers a chance to enjoy Desert dunes, whistling winds, beautiful landscape, etc. Additionally, the terrain SUV’s allows tourists to enjoy their trip a lot and has an unforgettable memory. Travelers who wish to enjoy the unique and unique taste of Dubai luxurious life can prefer our Hummer desert safari package. For our valuable travelers, we create high-class & sophistication environment and provide VIP protocol as well. It is an ideal package for those wish to visit more than the desert safari. This package most of all ideally suited for travelers who have minimum time to explore Dubai deserts. One of the highlights of this package is quad biking and other exciting & adventurous sports activities like sand boarding makes travelers avail fantastic riding experience. It includes several breathtaking things that bring travelers a fantastic choice to connect in the photo sessions and reaches the camel farm in the SUVs. Not only this, you can even enjoy quad biking on this evening desert safari tour. This specific package allows you avail an outstanding experience in the Dubai raw desert. It also adds several thrill and substance to this tour & makes tourists spare their whole nighttime by enjoying various adventurous activities. We designed this tour package to offer the perfect blend of luxury, comfort & grand to the travelers. With this package, you can explore and spend some time in the impressive landscapes of Middle East Asia. This tour brings unparalleled experience, which you can share with your family. Do you want to explore the Dubai city thoroughly? Well, make use of our Dubai city tour at a competitive price. It assists you to explore the active nightlife scene, luxury shopping, the outstanding architecture of Dubai, etc. Choose our Abu Dhabi city tour package if you want to have a luxurious yet comfortable vacation. This smart plan allows you to find several sightseeing chances and comes along with lots of inclusions. Tourists who want to enjoy a luxurious life in the form of the desert safari tour can opt for this tour package. It creates a sophisticated and high-class environment for all visitors and travelers to have an unparalleled experience. It is our 2-hour tour package, and we operate it 8times per day. This tour package ultimate aim is to give such an excellent experience to find the water in the Dubai desert region. Dhows are one of the most hesitate boats available in Dubai. It includes a fantastic combination of older culture and architecture along with several facilities. It also lets travelers enjoy and cherish some freshly cooked Dubai foods items. promotions, and other good stuff from Sunset Desert Safari Dubai. Are you planning for the trip with your family? Do you need to create the memorable moment with your loved one? Well, then the desert safari in Dubai is the best choice.Dubai is one of the most popular destinations in the world. You can find the huge range of the desert safaris in Dubai.